Interestingly, only 1 in 5 adults get the recommended amount of weekly exercises and physical activity. In other words, 80% of the population is not getting enough exercise. The most common reason? “I’m too busy”. There isn’t much time left in the day after working a nine to five job, coming home to help the kids with homework, cooking dinner, spending quality time with the family, etc. So what to do if exercise time doesn’t have its own entry in your daily schedule? 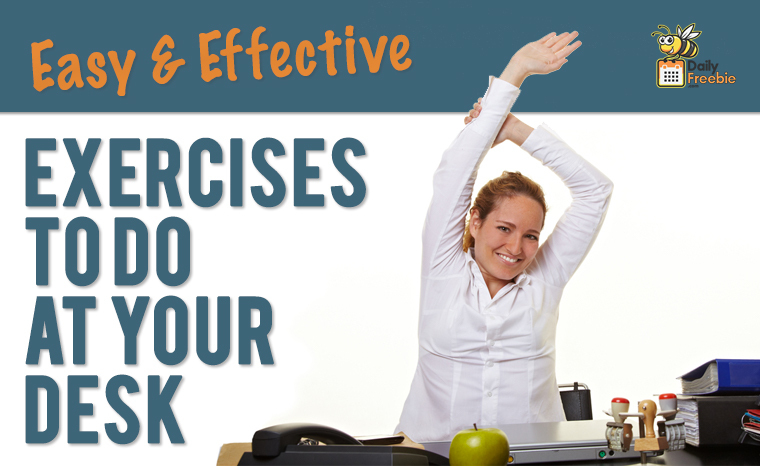 Exercise at work with these easy and effective tips. Let’s get started! You might have seen football players tap their feet while in practice. Called the foot drill, you can do so by gently tapping your feet in place for about 30 seconds at a time. If you can try for longer, all the better! Sitting at a desk for long hours puts a strain on your back, and this simple exercise can relieve tense or strained muscles. While seated in your chair, place your right arm behind your right hip. Twist the arm out (to the right side) and hold that position for about 10 seconds. Drop that arm and do the same for your left arm. Repeat the exercise about 3 – 5 times on each side. This is the equivalent of a yawn stretch, and you’ll love it too. Start by putting your hands on the armrest of the chair, using them for support as you move your bottom forwards in the seat. Slowly, straighten your arms, then proceed to lifting yourself off the chair in this position. Hold your new position for about 10 seconds before returning to the sitting position. Try this exercise about 4 – 5 times at one go. Tip: While seated at your desk, make sure your back is aligned with the chair. That puts less strain on your spine and ensures you don’t end up with more back posture problems than you bargained for. Slumping in the chair might feel comfortable, but it is seriously hurting your back. The knee press provides an ideal way to stretch out your glutes. Start by placing your left ankle on your right knee. Gently but firmly, press the left ankle against the right knee a couple of times. Once you are done with that, repeat the exercise on the other ankle as well. You can repeat this exercise once every 2 – 3 hours. You can do this at your desk or take a walk to a more private area as this exercise is not as inconspicuous as the others. The principle is to hold something for support while standing. Afterwards, proceed to lifting yourself up till you are standing on your toes. Slowly, lower yourself back to the floor so that your feet are now on the ground. Repeat these ten times in succession, take a break of 30 seconds to a minute and go again. Try a total of 3 times (3 sets) at one stretch. Extend your arms out and make sure nothing is in its way. This is to ensure you don’t hit anything when going for this exercise. Once that is done, ball up your fists in front of your face. Visualize a punching bag in front of you and punch away. Don’t put all the work on one hand, so try switching the punches between the right and left fists, ensuring that they even out in the end. Go for 30 seconds at a stretch, pause for a moment and go again. Like any other cardio, this is sure to get your heart pumping faster in no time, besides helping you release stress. Set a one- or two-hour timer for yourself, and when that bell dings, get to walking. You don’t need to take a long walk. Any distance that can be covered within 30 – 45 seconds is good enough. Try this 3 – 5 times, ending it by being back at your desk. Tip: You can try parking your car a little farther away from your office than usual. That gives you extra walking time when you are coming in and leaving. Hopefully these tips provide you with the exercise needed throughout your day. Start slow and gradually introduce new exercises every few days. Good luck!